Southeast Asia, currently Malaysia and Singapore. It was a major trade centre for Asian goods. The Straits Settlements were established in 1826 after the the Anglo-Dutch Treaty of 1824 which divided the Malay peninsula into British territory in the north and Dutch territory in the south. The settlements consisted of Malacca, Singapore, Penang, and Dinding. The capital was moved from Penang to Singapore in 1832. From 1826 to 1867, the Straits Settlements, under the administration of the British East India Company, were at first penal settlements for Indian prisoners. Ten years after the Sepoy Rebellion of 1857, the Straits Settlements became a British Crown colony. Dinding ceded to Perak after the Pangkor Treaty of 1874. In 1941, starting with Penang, the Straits Settlements were invaded by the Japanese Empire. The Malay peninsula was occupied until 1945 which resulted in the dissolution of the colony in 1946. The Federated and Unfederated Malay states, along with Malacca and Penang, became the short-lived Malayan Union. 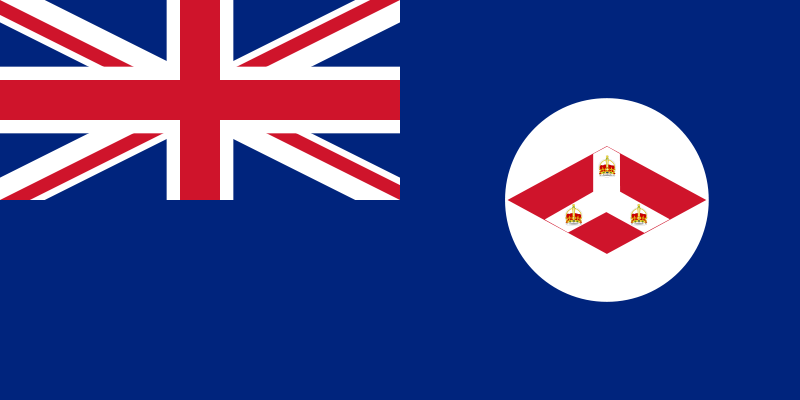 Singapore became a separate Crown colony. Spanish colonial dollars, which were the dominant Western silver coins in Asia in the late 1700's to mid-1800's, circulated in the Straits Settlements along with local state kepings and the Penang dollar. The British East India Company rupee began circulation in 1837 to create a unified currency for the Malay peninsula. Coins for the Straits Settlements were first issued in 1845. These coins did not indicate where to be used and were not part of any official currency; however, unlike the rupee, it was decimalized. Coins were reissued in 1862 with the inscription "INDIA / STRAITS" to indicate usage in the Straits Settlements. The East India Company title was dropped in 1871 after the Straits Settlements became a Crown colony in 1867. The colony issued its first silver coins that year in denominations of 5, 10, and 20 cents with a fineness of 80%. A 50 cent coin was issued in 1886 and, in 1895, British trade dollars circulated exclusively in Hong Kong and the Straits Settlements to ultimately replace other European silver coins from circulating. In 1903 the trade dollar would circulate only in Hong Kong and become their dollar unit. Because the Straits Settlements did not have a dollar unit, the Straits dollar became the official currency for the colony. The first silver coins were issued 1903 and copper subunits were issued the following year. In 1904 any other coinage circulating in the Straits Settlements would cease to be legal tender and the new currency was pegged at 2 shillings 4 pence in 1906. 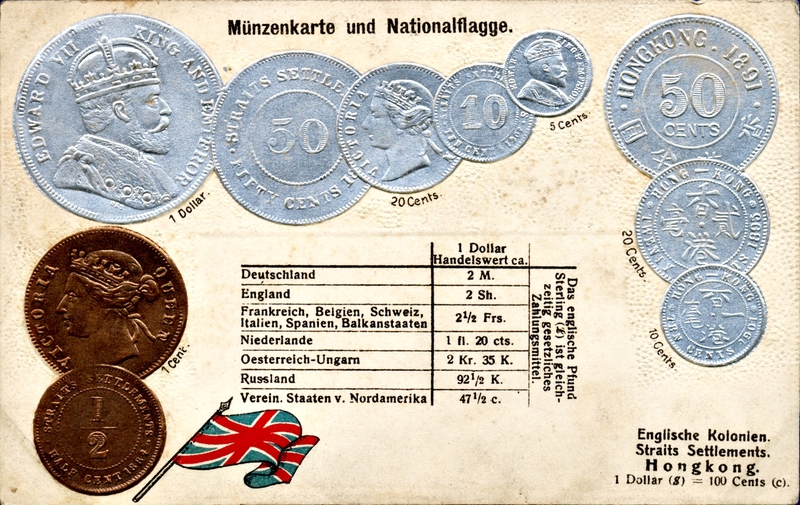 In 1907 subunits were reduced to 60% fineness and the dollar was reduced in size; again, in 1918 to 40%. This was to prevent melting of the coins due to rising values in silver. Dollar coins were issued from 1919 to 1926 with 50%, and copper coins from then on would be square to prevent confusion between silver and copper coins. In 1920 a 50 cent coin was issued with the same fineness and a 5 cent coin was issued in nickel. Values in silver dropped slightly and from 1926 to 1935 silver coins were issued again with a silver content of 60%. On Straits currency, all coins are in English. However, trade dollars have the value written in Chinese and Jawi Malay, languages dominant in Hong Kong and the Straits Settlements, respectively.